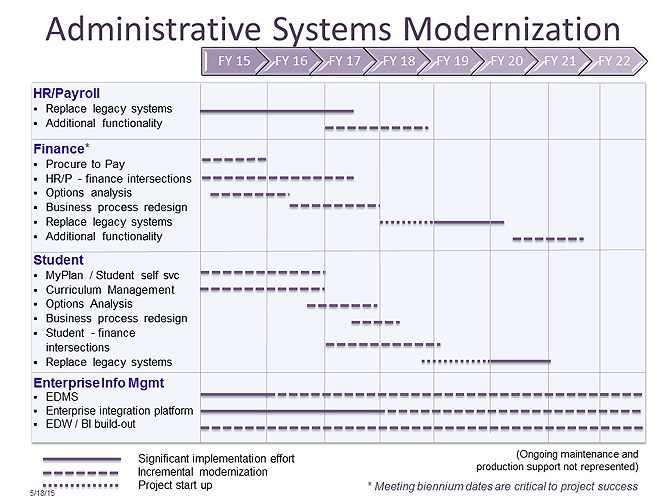 The University of Washington’s strategy for replacing its legacy administrative systems leverages new offerings in the large-scale Enterprise Resource Planning (ERP) systems marketplace, such as Software as a Service and consortium approaches, and builds upon recent lessons learned from higher education institutions and industry. By moving forward with adoption of integrated ERP software later than many other higher education institutions, the UW has the potential to skip a generation of technology and to deliver functionality faster, with greater flexibility and at significantly lower cost than was possible just a decade ago. Given the scope, scale, and complexity of the University’s environment—a $5 billion global research enterprise with four medical centers and research operations around the world—this strategy includes the following assumptions. HR/Payroll Modernization: Move forward with system replacement using a Software as a Service solution. The software solution is from Workday. Finance Systems: Discontinue incremental improvement efforts in current legacy Finance Systems. Redeploy resources to the HR/Payroll Modernization initiative and to an analysis of Finance Systems replacement options. Leverage momentum and expertise developed during the HR/Payroll Modernization initiative and proceed with a Finance System replacement immediately afterwards. Complete the Procure to Pay initiative to realize benefits of spend management. Student Systems: Continue to improve the student experience through incremental innovation, expanding functionality in the MyPlan academic planning tool; building out financial aid student self-service; implementing a Curriculum Management System to manage information about the UW’s course offerings, learning objectives, program requirements and fees; and modernizing the undergraduate admissions process. Enterprise Information Management: Invest in building out the Enterprise Data Warehouse as the UW’s single source of central administrative data. Continue to expand data access and to provide new tools and resources such as Tableau data visualization software and UW Profiles Web-based dashboards that enable rich and meaningful data analysis and reporting. This high-level timeline shows the sequence of the UW’s replacement strategy.